This special package includes 7 items. Thanks Dan, you found this out before I did. For clarification, I always tell audiences that the message of the Shroud is Past, Present and Future. It is past in that it takes us back to the empty tomb–the resurrection seen as a historical event. It is present in that we can see on the shroud today–in the now–the extreme price that was paid for our salvation. It is future in that it represents a future event. Some may dismiss this, but what Paul writes about in 1 Cor 15: 51-53 references a future event…it hasn’t happened yet…but it is exactly what happened to Jesus in the tomb. How can I say that? Because Jesus is also called “the first fruits of the resurrection.” This means that if he is the first fruits…we are the rest of the fruit that follows at a later time. It is exactly the same concept as when the Jewish high priest was in the temple waving the first fruits of the barley harvest asking God’s blessing on the rest of the harvest. It is no accident that when Jesus rose from the dead…it was on the Jewish Feast of First Fruits! So my view is that the shroud is a picture of not just a past event but also a foreshadow of a future event as well. 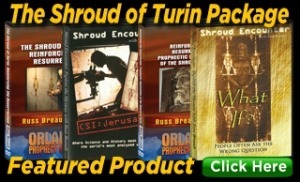 This is how the Shroud fits into a discussion of biblical prophecy. Lovely…a well prepared perspective and package, Russ; it keeps many of us together in faith, hope, & love. In his book “Jesus of Nazareth”, praised and recommended by Protestant scholars James C. Charlesworth and Craig Evans, Pope Benedict XVI says that the Resurrection does not stand outside or above history. It points beyond history but has left footprints in history. There are two footprints, one is the empty tomb, the other the appearances of the risen Christ. It is important to note, however, that the Jesus movement, to become the Church later, was a “Resurrection movement”, not an “Empty tomb” movement. The empty tomb was used only as an explanation about how it got that way, the texts that mention the empty tomb were written a long time after the event. Louis, I like your comment regarding the Resurrection Movement. Great point. Double that, and great Job Russ. I follow your work online and can’t wait to see the presentations in St. Louis. God bless you. Thanks for the remarks, Russ. I greatly appreciate all the good work you have been doing all along these years and am glad to see that it has gained recognition. Keep it up. Many sceptics fail to realise that the change in attitude among the first Christians was not because of an empty tomb. The body could have been stolen, or given to wild dogs, as J.D. Crossan alleges, the Jesus movement would have been nipped in the bud, the disciples would not have landed in the coliseum to be devoured by lions. In a nutshell, it is the reality of the risen Christ that gave birth to Christianity.